The Early Intervention Foundation (EIF) awarded HENRY the best possible cost score when they included us in their well-respected Guidebook, meaning our programmes have a low cost to set up and deliver compared to other interventions they reviewed during their rigorous process. HENRY’s focus on the earliest years of life and the holistic, broad-based nature of the HENRY approach and our family support services mean that commissioning HENRY offers value for money and a clear return on investment. Commissioning HENRY not only helps prevent child obesity before it is too late (see below), but also supports the development of thriving, emotionally healthy children at age 5 who are ready to learn. Nobel prize-winning economist Professor James Heckman calculated the economic benefits of social interventions provided at different ages – he found that investment in the early years gives a far greater return to society than later interventions, estimating that every $1 spent on early years repays $7 eight years later. 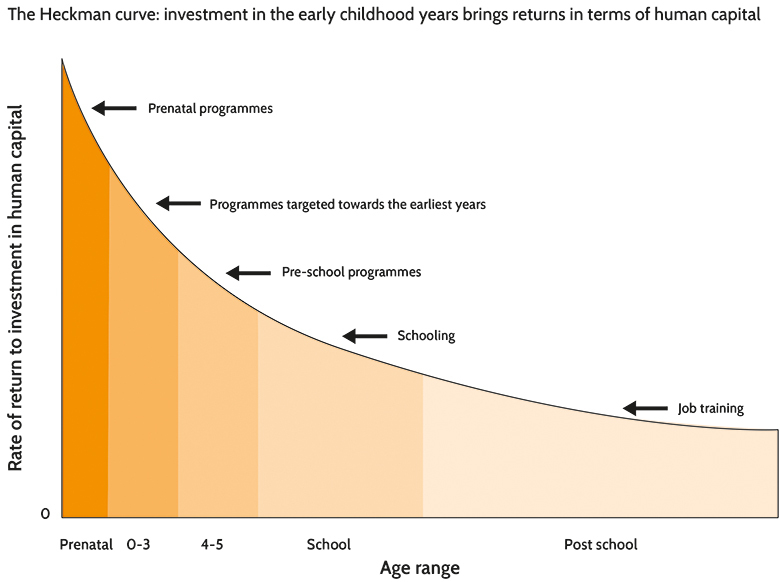 Other economists have compared the low costs of early years interventions to the very high costs to society of unemployment and looked-after children. HENRY often helps parents return to work or education, and has helped prevent children being taken into care. HENRY practitioner training can be commissioned for £125 per participant per day. Our Healthy Families programme can be delivered locally for a total cost of £320 per family. Contact us to find out more.